Along with doubts about whether people are fooling themselves when they notice the flow of energy, come doubts about a person’s intuitive ability. Am I really feeling drawn to that part of the body or am I fooling myself? I heard a word or phrase in my head, or I saw an image, is this all in my head? Am I making it up? Did my hand really feel like it was being pulled like a magnet to the person’s knee, or is this only because I know that they had an injury there? You need to know something: you are intuitive. Everyone is intuitive. You may not be used to noticing the intuitive messages that your body and mind are sending you, but they have always been there. Are you making it up? Yes, in a way: nobody else is giving you this information, it’s coming from you, from that intuitive part of you that generates such messages and insights, or that ‘inner knowing’. Maybe when treating someone you feel strangely drawn to a particular area of their body, your attention wants to rest there or dwell there. It might not make any sense, but that doesn’t matter. Just go with what’s coming to you and direct the energy there, resting your hands or hovering your hands over that area. Maybe when you’re self-treating, you feel drawn to a particular area of your body, well just focus your attention there and allow the energy to flow there. Just accept what comes to you and work with it. Some people have intuition come to them in terms of visual images or words or muscle movements: everyone’s different. Don’t assume that this isn’t real intuition, that because it’s you and you’re not intuitive, this can only be just nonsense. Just stop thinking and stop worrying and stop second-guessing yourself, and cultivate the lovely mindful state that you enjoy when giving Reiki. Ease into that lovely merged state and just accept what’s coming to you, allowing the energy to guide you in its own way, because you are already as intuitive as you need to be, and the way to access your intuition is to just merge with the energy, and let it happen. 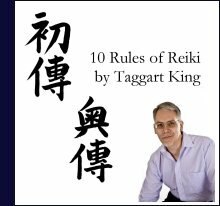 The Ten Rules of Reiki were put together by Taggart King as a helpful guide to getting the most out of your Reiki. If you like what you’ve read, Taggart has a wealth of Reiki resources for you to use to get the very best out of your Reiki. Read comprehensive manuals, listen to audio CDs or MP3s and follow special guided meditations. You can even use all these resources for your own Reiki students: Click for ordering manuals and CDs at discounted rates. “The Ten Rules of Reiki” will help Reiki practitioners and Masters from all lineages to deepen their experience of this wonderful energy we work with. 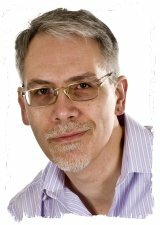 International Reiki Master Teacher Taggart King has over 20 years of experience in helping people to embrace Reiki healing as a way of life, using the energy to change things for the better on many levels. During that time he has crafted a number of principles which, when adopted, can really move your experience of the energy onto the next level, principles that feed into and permeate the Reiki Evolution way of teaching. On this hour-long audio collection you’ll hear Taggart talking about each principle in turn, why they are important and how to implement them in your life with Reiki. I have to agree with this as a Reiki practitioner. The reason why we call it ‘intuition’ is because it is Inside. Once you begin to trust your inner knowing. It will get easier and clearer. That sounds interesting, Taggart. I do enjoy reading your posts. I’m going to meet Sue, in Rossendale on Saturday to do the First Degree course and I’m really looking forward to it. The supporting literature is excellent and I feel well prepared. I’ve had some very positive and enjoyable experiences already, practising the daily meditation and self healing techniques. Look forward to you next post.